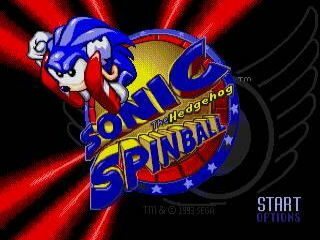 Releasd in November 1993, Sonic the Hedgehog Spinball is the Mega Drive/Genesis Sonic game with the best title screen music. The team found out at the last minute that they didn't have rights to the traditional Sonic title track, so the excellent composer Howard Drossin escaped to his dark lair of synthesizers and composed new and awesome music immediately. Oh, and there's a pinball game somewhere in there too, although rumor has it the physics are best not described as such. Best time: 0:15:41 by Mike 'mike89' McKenzie on 2011-09-11. Flip, mikwuyma, Breakdown, dex, VorpalEdge - the SDA crew, keeping things awesome! Nate - Still the man when it comes to encoding and video in general. Cool Matty - Started the talk about getting a run of this up on the site, with his incredible 29 minute time... He did give me a couple of very useful tips, though, which made running the game... not easier, but less hard. moooh - Contributed another couple of handy tips. Basically my involvement in this run started with me seeing Cool Matty playing the game on stream one time and picking up the game myself to see if his times were any good. Within two attempts I'd managed a 26 minute time, then a further two brought 24 and 22, at which point he conceded to me. Enter the three weeks from hell while I started to really optimise this run. This game has some, uh... at best unintuitive, at worst counter-intuitive physics. I'll explain in the comments as I get to particular areas, but there are a number of places where your run can just die and it's not your fault at all. This run is played on Fast speed, for obvious reasons. Before I start, there's one general thing about running this game: you actually have a lot more control over Sonic than it might initially appear. If you hold down Sonic's gravity greatly increases, making it much easier to make flipper catches or even adjust your angle if you think you've missed a shot slightly. I've had better starts, but I'm still happy enough with this. Straight away there's one shot where I don't stop to line up - there are certain situations where you can get away with this, almost always when you're aiming for the outside of the flipper. Also, thanks to Cool Matty for helping me line up the bounces over the worms at the top of the first board. On the second level, you only need to play one board, because the flippers in the mine cart ride can put you on either side. One potential improvement to the run is pulling off a relatively well known glitch where you can hit the corner between the door and the ground and, at certain angles, you will simply grab the corner and be allowed in. However, it's a very precise shot, even more so than any other shot in the game, and doesn't even save an appreciable amount of time, unless you hit it -three times- in succession. It's also possible to get it with a regular worm loop shot, if you hit it fast enough. I did miss the bridge shot though, and it makes a pretty good time to talk about the lights that indicate where each ramp is. Sometimes the lights are good indicators of where to shoot, other times they aren't. In this particular case they're perfectly in line with the actual angle... but when you go to catch Sonic the screen scrolls down and you can't use them anyway. So I learned to use a particular point on the flipper to shoot from instead. Moooh pointed out that you can hold down in the tube up to the boss room and not get shot up to the top, which triggers a "Sorry, you need x more Emeralds..." message and also stops Sonic in place for a second or two. This boss is very, very glitchy. There are all sorts of weird things that can happen with the tail: sometimes the sprite doesn't appear (though it still exists and acts as normal), sometimes you can shoot straight into the tail and he'll attack as if you're not there, sometimes you just glitch out of the closed side of the tail (although I've never, ever fallen out of the open side), and once I actually managed to get killed while bouncing around for hits. Once you knock the tail off it takes somewhere between 3 and 5 hits to finish the job. If the hole at the top middle is open it will spit you down to the bottom, so I was very lucky that it didn't open up while I was bouncing around up there. Let me just get this out of the way now: AAAAAAAAAARRRRGGGGHHH. These are incredibly random, awful excuses for stages. Basically the game shoots the ball out at a certain angle, one that is very, very bad for speedrunning, because it hits the top bumper in a way that sends the ball up to the top, and in all three bonus stages it is substantially faster to fail the stage than clear it. The basic strategy is therefore to shake the board as soon as the ball comes on screen - there's no way to know exactly what's going to happen, but any angle is better than the default. Sometimes you'll get lucky and it'll keep low, and maybe do something nice like go straight in the gap on the other side, or sometimes it'll shoot high, straight into Robotnik and down the chute. Or sometimes it'll just get stuck up the top for ages. Once the ball hits the flippers it tends to stop dead, too; another reason for holding them up the whole time. This stage was probably below average luck. At least the last ball went well. Interestingly, the best part of this entire run was due to a mistake! What I was trying to do here was use the right flipper to roll up the right hand gap, and into the seesaw on the other side, which puts you straight into the Steam Arena. However, I didn't roll up it right, and thankfully so because if you go halfway up and can't get all the way, rolling back down that gap triggers an enemy which makes the next shot I'm about to attempt pretty much impossible - I call it the Ferron shot. Basically there's an enemy that blocks a hole that's not intended for you to use until you collect the middle Emerald in this stage. However, it takes a couple of seconds to respawn after you kill it, just enough time to get through if you hit the shot just right. I was particularly lucky on this occasion that I bounced straight down towards the left flipper (you can bounce pretty much anywhere, and you only have enough time for one straight shot). From there it's about making sure you get close to the inside of the flipper and time the shot so you go straight in. After that the two top tables are pretty easy. I'm trying to pull off a couple of reverse shots from the inside flippers towards the corks, normally a well timed shot from the outside of the flipper, holding down and towards the cork, gets back in perfectly. It didn't work for me this time, though. The Steam Arena is the one remaining area in the stage which can ruin a run of this level. Normally you can actually predict when the first cluck will come out (you see me do this on the shot to the boss room), but making the Ferron shot actually put the timing out for the others. I was pretty lucky considering; it's very possible to be stuck in that room for upwards of 30 seconds waiting for a cluck to give you the right bounce. I only missed two shots. I had a really bizarre glitch though: sometimes when you spindash up a ramp the game just thinks you're skidding, for no real reason. This one's not as glitchy, but it'll still throw the odd curveball at you, like if you get jammed between a head and the wall you can be pushed out of the boiler. It's also possible to make the fight unwinnable: if you shoot straight in like I do in this run and fall straight through the middle before the heads gain their hitbox, they actually never gain their hitbox and you can't win the fight! Basic strategy here is to make sure you can shoot straight in to the boiler. This isn't as obvious as it looks: the steam actually won't fire unless you shoot up towards the top of the screen, so if you just hold Sonic down the bottom it'll always be waiting for you. To counteract this you can shoot a short shot at one of the targets on the bottom instead, which gets high enough to trigger the steam, then get an easy shot in. Alternatively, if you take out the bottom head, you can shoot in through the bottom, but it's not an easy shot. While I missed it on the last hit, it ended up having the same effect as the usual shot to trigger the steam, so I got a free shot in there through the top anyway! This one has the potential to go really bad, sometimes you take some of the teeth out and the ball just rebounds in there all the time and there's just nothing you can do. This one went really well, a good 6 seconds faster than the first. This level starts in a really odd way: I simply hold Sonic in the left flipper for about 15 seconds. What I'm waiting for is for the emerald cage on the right hand side to open: I can see when this happens because there's an icon between the flippers on this board - people seem to miss this really easily! There is another potential route on this level, which would be to go straight to the left board and take that emerald first - there are two problems with it though: the shot up to that emerald is much harder, and you have to wait for the cage on the right hand side anyway, which leaves you way too much at the mercy of the Animal Prison. Speaking of that... the luck I got in the Animal Prison was unreal, unlike anything I've ever seen. You get two runs through it (both the top right and top left emeralds put you in there) but it's such a random area that I like to get the emerald on the first trip if at all possible. But I got knocked straight back out, which in retrospect worked out pretty well. On the first occasion you have to fall to the left hand side because of the emerald there, so again it worked out really well. Probably my one mistake in the actual stage was hitting the enemy in the left shaft at a bad angle, I couldn't be sure I was going to make a clean catch just by holding the flipper so I played it safe and got a shot on it to give myself more room. Then the second run through Animal Prison... I'll be honest, that's the main reason I'm submitting this run. That's never going to happen again. A couple of different ways you can do this. The method I use here is the most reliable I know of: for some reason, it's much easier to get a hit loop on the left edge than the right edge. If you tried to get a hit loop on the right edge you'd have to drop back into the table, get the shot, and have Sonic stay there. I don't know why, but it just doesn't work for more than about three hits on that side, after that he'll bounce off in some other direction and down the hole again. Then after that, the luck isn't over: ideally one would shoot inside the Machine and stay inside for long enough to kill it in a single round. However, this doesn't often happen, and indeed the few times I have managed to one round this boss, almost every time I managed to bypass one of the enemies blocking the hole and use it to bounce straight back in when it knocked me out! I'd call three rounds pretty average luck. Wow. 18 seconds from start to finish. This, on its own, can go as much as 40 seconds longer... This one is the worst, because it's really easy if you catch the corner of the top bumper, to be stuck up the top being knocked around between the capsule and the clucks, and you then can't see where it comes out either until very late. I got the most incredible luck here, it can't be stated enough. The shots up to the triggers on this first board are very difficult because there's absolutely no indicator for where to shoot. It's also just a very precise angle you have to hit in general, which shows itself really blatantly on my first attempt at the last shot: I was positive I had the angle right and not only did I miss the shot, I went up the ramp alongside it! It only cost me a few extra seconds compared to a regular miss, but it looked bad. Now I go from left to right because it's easier to get to the boss room from the right hand side. These ramps are annoying because the lights are on nowhere near the right line - you have to shoot earlier than the lights imply. Once up the ramp, simply holding the flipper nearest the edge you're moving towards lands you on a flat area to spindash to the outside emerald from. Again, the lights to the outside emerald shots are aimed very badly, but I don't even use the lights for them. I wait for Sonic to bounce on the flipper twice and then shoot at the height of the third bounce. The route ends at the inner right emerald, because it gives me an easy shot to the boss room. Before entering the boss room though, the game throws one more curveball at me and glitches on the ramp. Twice. I got really unlucky at the start and got forced out of the boss room, but then got really lucky straight after and got back in really quickly. Then the real fun begins. After landing three hits on the trigger, I now have to shoot up the ramps and hit Robotnik ten times. What makes this hard, is on Fast speed, if you hit the shot perfectly you actually fly straight over Robotnik and don't hit him at all. So you have to hold down and in the direction you're firing to slow him down enough to get the hit. What's more, if you're really lucky and time your shots well, as Sonic falls back in you can shoot him straight back up the same way. I managed this four times in a row, which is a record for me on Fast. Then... heartbreak. With just one hit remaining, and not much time left in the round, I made the shot up the ramp... and stopped dead. The hitbox here actually only applies right at the top of the glass, so even though it looked like I hit Robotnik it wasn't really close to counting. Then... "Smell my socks!" So now I have to hit the trigger -five- times to get one lousy hit. That entire escapade cost me 40 seconds. 40 seconds! That's a huge chunk out of a 15 minute run, so how can I accept it? Well, I hit most of my shots, and the luck I had was absolutely incredible. That, and it's a terrible game and I didn't really want to run it in the first place, and certainly don't feel like spending any more time on it than I have to. Enjoy the run! Cause I sure didn't enjoy making it.